The capillary lamps are a fragile product. Handling and operation must be clearly understood. Most conditions associated with lamp return are a direct result of incorrect operation and / or mishandling. 1. Capillaries are a “Graded Seal Lamp”, making this product impossible to hear in an annealing process. The quartz at the graded ends of the lamp has a lower melting point than the quartz body. The annealing process heats the lamps in a furnace for a given period of time. This process relieves the stress during the lamps manufacturing process. The lack of annealing results in a lamp that is very fragile requiring great care in installation. 2. The ON and OFF cycling of the lamp is temperature related. 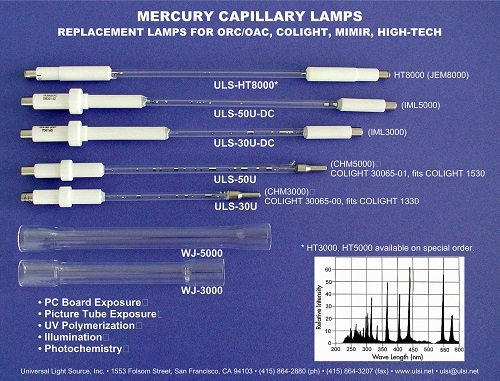 Capillary lamps are designed for intermittent operation only. The longer or hotter the burn period the shorter the lamp life. Typical life rating is 7000 shots at 40 seconds or less, 3000 shots for over 40 seconds. If the ON cycle is extended, the lamps internal pressure increases, as well as the potential for violent lap failure. It the OFF time is too short, the rise time into the mercury vaporization may be effected and the migration of the mercury away from the electrode to the center of the lamp will be inevitable. This will result in lamp instability and dark electrodes, resulting in early failure and possible lamp explosion. 3. It is critical for proper ignition to manually distribute the mercury into even pools at each end of the lamps in front of the electrodes (see instructions included with each lamp). If the mercury is not properly distributed, the operation ON/OFF time may be affected, resulting in a hard-starting lamp which could fail or explode causing short life. As this lamp had a graded seal, there is a large dead spaced behind the electrode tip. This space must be filled to allow a certain portion of mercury to enter into ionization. If all the mercury does ionize, the lamp becomes saturated. Mercury Saturation resulting from an unbalanced lamp will cause unstable current regulation. IT IS VERY IMPORTANT TO BALANCE THE MERCURY! 4. Capillary lamps rated over 1KW require water-cooling. The user must evaluate the rated GPH for the required wattage. Water must be deionized and checked and changed frequently to eliminate ion concentration. Mechanical equipment must be checked frequently for water leaks and gasket failure. 5. Many lamps are returned for breakage during installation. As the lamps end is nickel-plated and the spring load in the system is the same, the lamp must be carefully installed to eliminate the lamps from slopping to one side from the two polished surfaces. This will result in a lamp slightly cocked to one side in the water jacket. This creates a thermal stress when the lamp is heated resulting in hairline cracks in the lamp body and early failure.